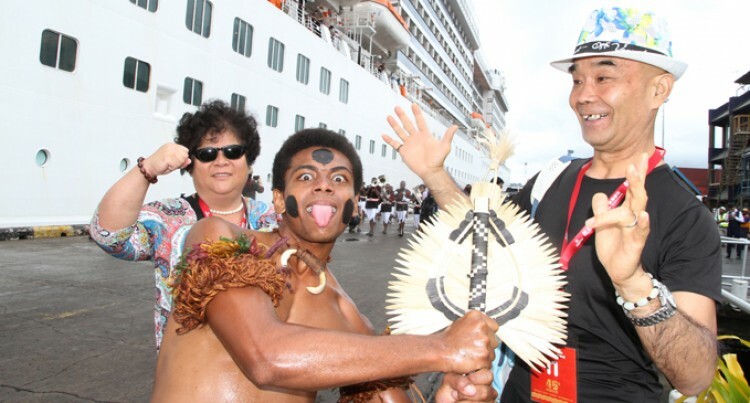 Fiji Arts Council dancer, Jope Kalaunikaikesu entertain Chinese tourist Kim Sao Ho and Jan Hong as they arrived via Cruise Liner Costa Atlantica berth at Kings Wharf yesterday. Photo: Ronald Kumar. A blog writer from Shanghai, China says visiting Fiji and other Pacific island countries has been ‘one of the best times’ of her life. Erica Yinrong Chon was among the 2000 Chinese tourists on board the cruise liner Costa Atlantica, which berthed at the Port of Suva yesterday. “I will make sure I take back a lot of good memories with me when I return home,” she said. The tourists are among China’s first 46-day cruise to the South Pacific. This trip to the Pacific Islands would also be the first Chinese originating cruise to be crossing the equator and the International Date Line. The cruise is visiting 12 destinations in nine countries including Saipan in the Northern Mariana Islands, Papeete and Bora Bora in French Polynesia, Pago Pago in American Samoa, Nuku’alofa, Tonga, and Rabaul in Papua New Guinea, as well as Fiji. Chen DanDan, 30 is travelling with her boyfriend Kin Dowon, 26. She said despite being seasick they were both enjoying the voyage. “I am very excited because this is my first time in Fiji and I can see that the place is really beautiful,” said Ms Chen. Costa Atlantica’s next destination will be Tonga and it will be leaving today at 6am.